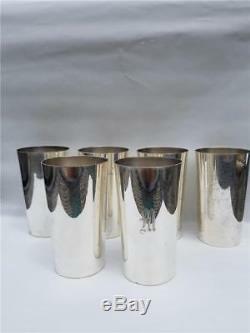 Estate set of 6 mint julep cups, A. SCHULTZ 1920 STERLING SILVER MINT JULEP CUPS TUMBLERS. 1920 STERLING SILVER MINT JULEP CUPS TUMBLERS - SET of 6. Own a piece of history! Beautiful and hard to find set of 6 mint julep cups crafted by renowned silversmiths A. Of Baltimore, MD, and retailed by Hennegen Bates Co. Another renowned Baltimore Company specializing in high-end jewelry and sterling. This set was a 1920 wedding gift. Each cup measures 4 7/8T, weighs. Approximately 4.55 troy oz. Monogrammed with an "M", and fully marked with both the Schultz and Hennegen Bates marks. The mint julep drink first appeared in an 1803 recipe book, but it became widely popular in the 1930s. During this time, Mark J. Searce designed and marketed what we know today as the classic mint julep cup, which is squattier and has a decorative rim. In 1938, the drink became officially linked to the Kentucky Derby and Searce's cup style became the standard in look and size for serving the drink. Prior to the 1930s, mint juleps were usually served in taller sterling cups, such as this Schultz set currently offered for sale. These early style cups are not easy to find, much less so in a set, and in such excellent condition. These beauties pre-date the mint julep rage by almost 20 years! This set was rarely used and is in excellent estate condition with some very slight/minor scratching from age and use - they just need a good polishing, preferably professional. Fun to use or beautiful to display.